First, we have the Animals of South America decal collection which has whimsical trees and animals. Perfect for your little explorer! Next, we have the Arctic and Antarctic Animals and Polar Friends. 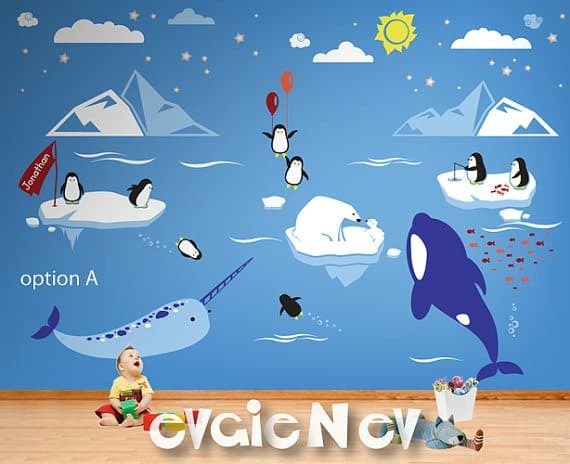 Who doesn't want cute little penguins and friends on their walls right!? All decals come with a free test decal so you can get the hang of applying them before moving on to bigger projects. 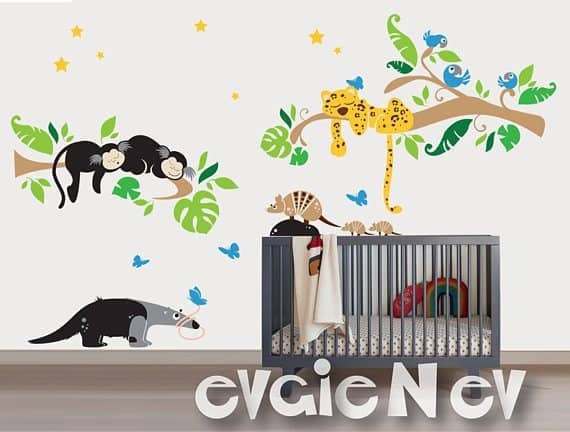 Next, we have the always fun Monkeys Wall Stickers. I love the color pallet they use for this style. It would look so sweet in a nursery! 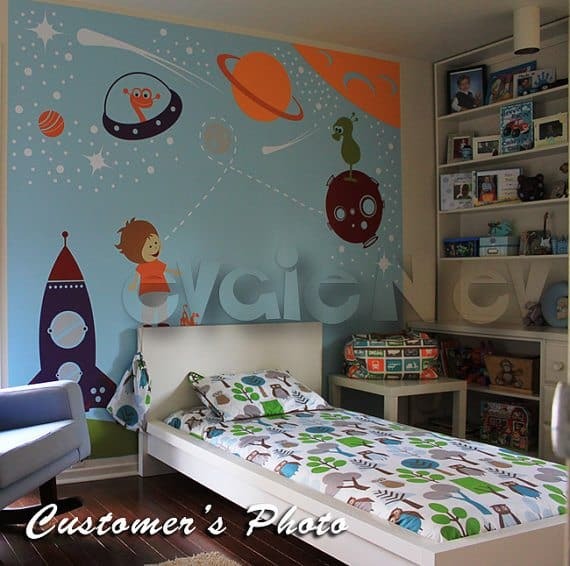 For your little one that loves all things space, they will be over the moon for these Outer Space Wall Decals! Another super cute jungle themed decal set, the Animals of South America set has super cute animals and scenes straight out of the jungles of South America. Wouldn't it make an awesome mural in a kid's playroom? Last but not least, we have the classic Adorable Teddy Bears set. Who doesn't love a cute teddy bear hanging from a tree above the crib? So stinking cute! 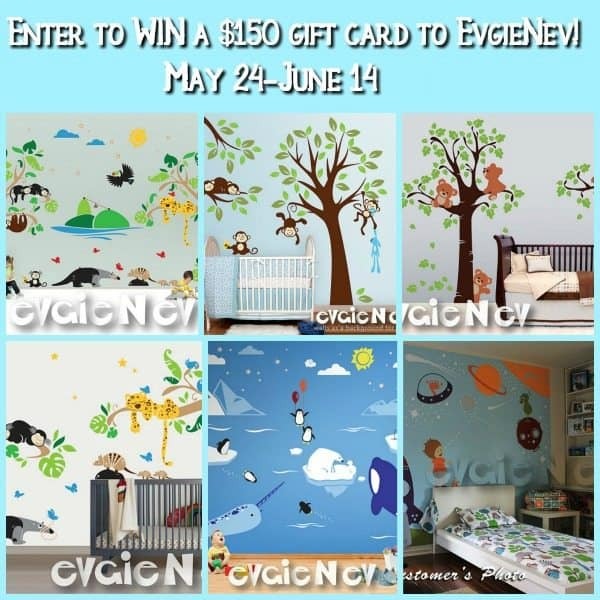 I love the EvgieNev Fairy Wall Decals, Tree with Flowers and Stars Wall Stick set for my granddaughter's room. I love owls so I would go with the Children Wall Decal Wall Sticker -Cute Owls on Tree Decal. I would buy the Arctic and Antarctic Animals and Polar Friends decals. I would be giving this to my newest granddaughter who is going to be born any day now. I like Koala Bears Wall Stickers - Wall Decals for kids room, Tree and Five Little Koala Bears with Balloon - PLTBRS030. I really like the Forest Wall Decals - Famous Birch Trees with Birds Wall Sticker - TRFR010R. There are so many to choose from! Thanks for the awesome giveaway opportunity! I would use it to get the jungle safari I think for my granddaughter's room. i like the baby nursery woodland large! It is perfect for my baby's room! The moose or the deer wall decal. I like the enchanted owls. Under the Sea Nursery Wall Decals - Mermaids, Underwater Castle, Dolphin, Octopus, Stingray, Sea Turtles, Crabs & Treasure Chest - PLMRM070 for my sweet as sugar Chloe Pearl. She has a mermaid room and I would be so grateful to win this! I like Valentine's Wall Decals - Teddy Bears LOVE Wall Decals - Hearts Baby Nursery - Boys & Girls Room Decals. The Abstract Flowers decal is a fun one!! I would get the Cherry Blossom Tree Wall Decal with Birds. If I win, I will buy the Forest Animal Friends decal. Baby Deer with Birds and Tree decal would be perfect. Thanks! i LOVE THE DIFFERENT BLOSSOM TREES AND THE PERSONALIZED NAMES. i would get the tropical nursery wall decals if i was the lucky winner. I would get the Garden Wall Decals - Tree with Birdcage and Birds Wall Stickers for Nursery - TRGD010R. I like the jungle themed animals. Vinyl Wall Sticker Decal - Tree and Flying Butterflies! I like the Moose Wall Decals - Trees Wall Decals and Wall Sticker. 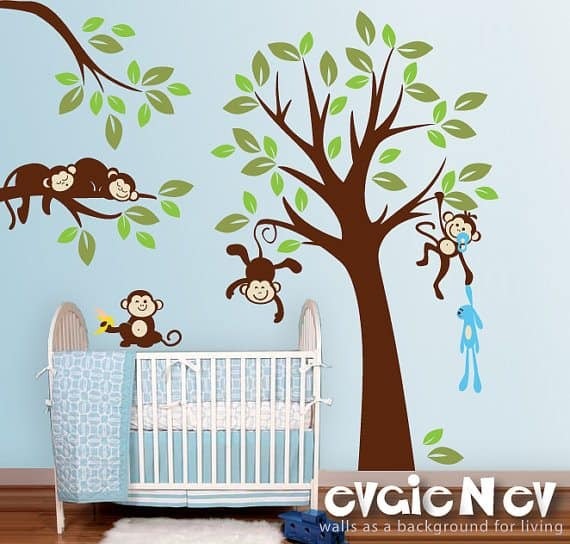 I would buy the Monkeys Everywhere wall decals! They are adorable! I would buy a Personalized Ukulele. I love The Enchanted Owl the most of all of the great designs.